Annahilt consecrated in July 1856. Organist Timothy Wilson (left - second row) and the Church of the Ascension Choir pictured on Sunday 21st May at a Festival of Flowers Service celebrating 150 years of continuous worship in the church. L to R: (front row) Ian Dunn - Rector’s Warden, Derek Capper - Diocesan Reader, the Rt. Revd Harold Miller - Bishop of Down & Dromore, the Revd Canon Robert Howard - Rector and Miss Patricia Halliday - People’s Warden. There has been a church on this site since the Eighth Century. The original church was dedicated to St. Moliba and was probably destroyed in 1641. A new church built on the same site was consecrated on 29th June 1741 (St. Peter’s Day) and the tower was added in 1768. The present church was consecrated on 29th July 1856 and the deed of consecration states that the previous church was condemned by William Fullerton, Architect to the Ecclesiastical Commission. In 2001 a new stained glass window was dedicated to celebrate the Christian life and witness over the years. Derek Capper was appointed diocesan reader in 1991. 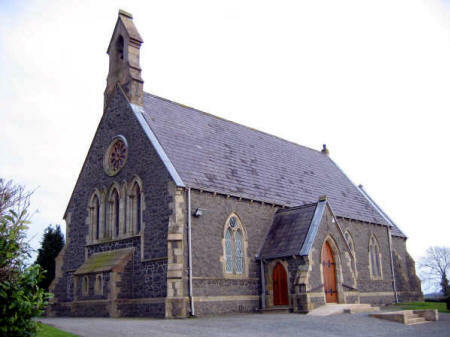 The Rev Canon Robert Howard was instituted as rector of the grouped parish of Annahilt and Magherahamlet on 4th February 1994. 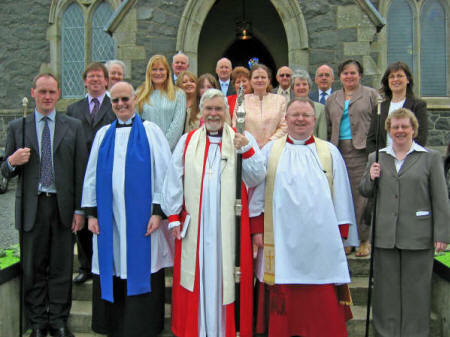 He was installed as Prebendary of Dromara on the Chapter of Dromore Cathedral at a service of installation in Dromore Cathedral on 24th March 2006.